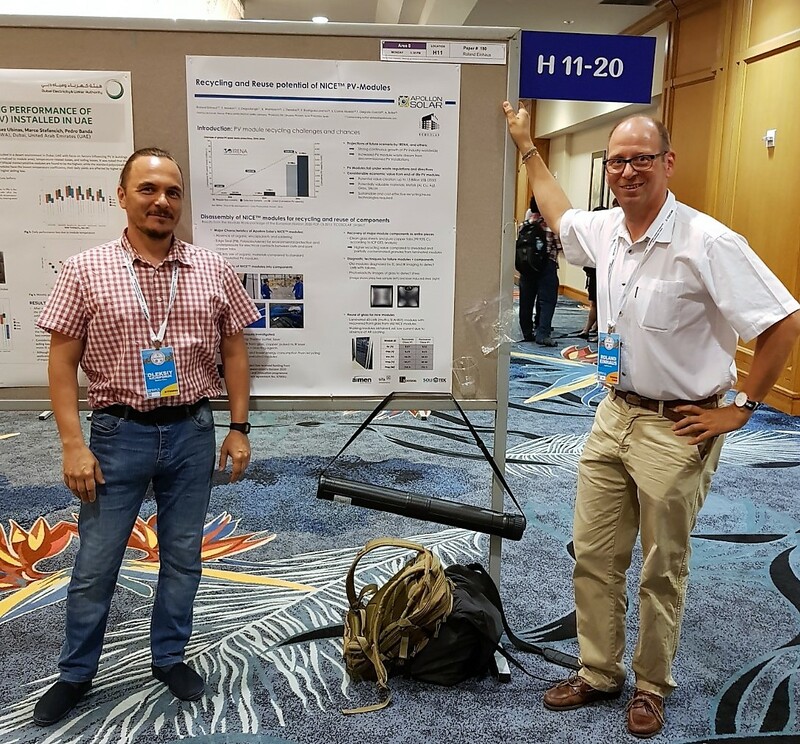 On the 11th of June, Apollon Solar had a poster presentation at the WCPEC. Underneath an impression of the poster presentation and the staff involved. Oleksiy Nichiporuk on the left and Ronald Einhaus on the right. The poster presentation is to be viewed on our Publication page. 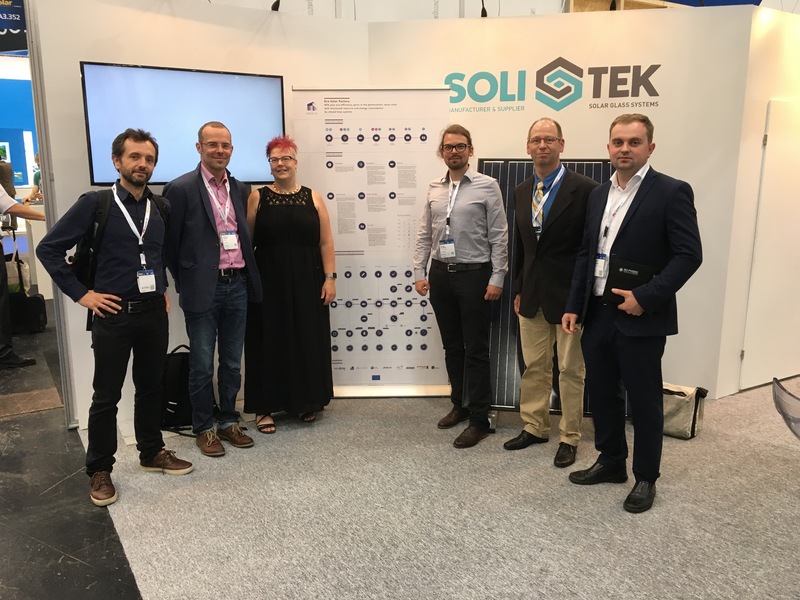 The presentation will show results from WP4 (Module design for remanufacturing) of the project, in particular on the disassembly of NICE PV Modules from Apollon Solar into their major components, focussing on glasses and copper tabs. The fact that these components can be recovered as entire pieces opens up a more sustainable and high value recycling and reuse potential. Partners involved with this work are: Apollon Solar, AIMEN, bifa, INGESEA, Solitek. 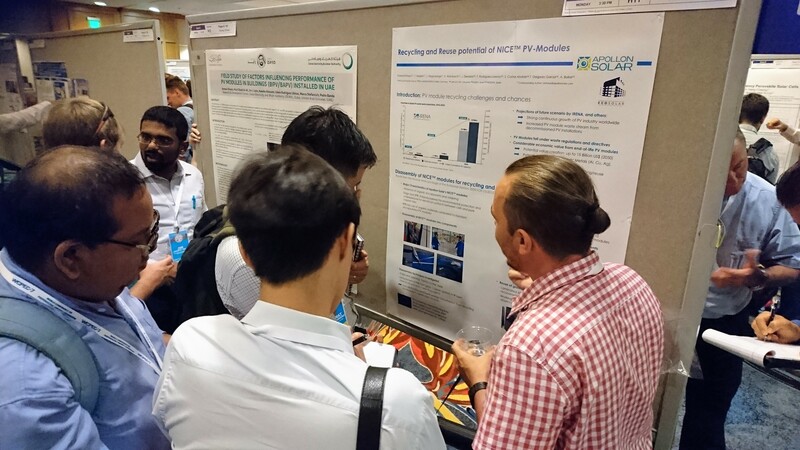 Eco-Solar organised this workshop in cooperation with the H2020 project CABRISS. During the workshop, 35 participants from industry and institutes lively discussed the valorisation potential of 8 different kinds of waste selected from the value chain of photovoltaic production. Several creative solutions were identified and collected on canvas. Some groups already agreed on follow up meetings to elaborate deeper on cooperation potential to market the wastes. The H2020-funded Eco-Solar project is organising a workshop to discuss how to create value from PV waste. The event will take place on April 10th, 10h – 16.00h in Maritim Hotel Munich (near the main train station). At this workshop, we would like to discuss how to retarget waste streams from the solar value chain into valuable products. We have limited space available for participant in order to encourage lively and constructive discussions, therefore participation is on invitation only but if you are interested and haven’t received an invite yet, please email us with information about yourself and why you are interested in this workshop, to Ecosolar@boukje.com. The EU PVSEC 2017, the 33rd edition of the European Photovoltaic Energy Conference and Exhibition, offers you an excellent opportunity to absorb, update and discuss the most recent and relevant developments in photovoltaics. This world class event is held at the RAI Convention Center in Amsterdam, the Netherlands, from 25-29 September 2017. Please check the program for the total EUPVSEC. 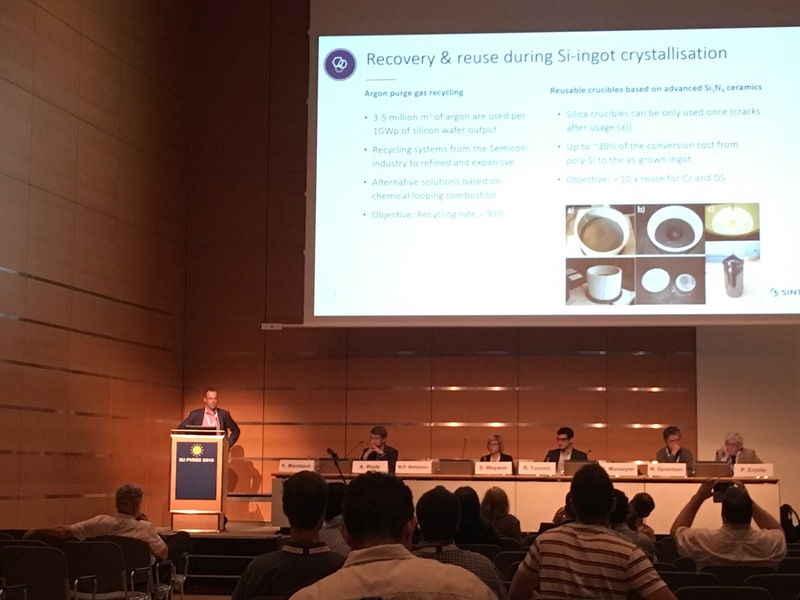 Eco-Solar Factory: Multicrystalline Silicon Ingot Crystallisation from Reusable Silicon Nitride Crucibles, oral presentation session silicon crystallisation 2BO.1. Advanced materials are key to tackle climate change, Energy Union and re-industrialization in Europe. perspective of clean energy materials. Eco-Solar and CABRISS are organising a joint-workshop to present recent results on new solutions for a PV circular economy. The workshop takes place during the Freiberg Silicon Days within the Freiberg University Forum on Thursday the 8th of June 2017. Results from the projects CABRISS and ECOSOLAR. Multicrystalline silicon is the dominant material used in photovoltaic technology for production of low-cost solar cells. Solar cells made of multicrystalline material make up a little over half of the worldwide solar cell market. The starting material is crystallised in fused silica melt containers and the obtained ingots are sliced into thin wafers to make solar cells. Since silicon at high temperature reacts easily with almost everything, and due to purity and mechanical requirements, manufactures are restricted to very few crucibles materials. Therefore, fused silica and fused quartz glass remains the material of choice for crucible and mould applications because it is readily available in high purity form and little reactive to liquid silicon.